ScaffoldExpress.com now offers Credit Terms to qualified individuals and companies. Please download the Credit Application below. Once the application is completed, to include the total dollar amount of credit being requested, mail or fax to ScaffoldExpress.com. If you have any questions please contact our sales department for more information at 800-592-1718 or e-mail us at orders@scaffoldexpress.com. 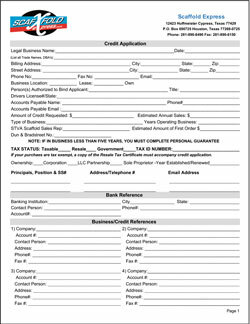 Please click image below to download a copy of our Credit Application and Terms. Application without a dollar amount entered in 'Section A' will NOT be considered or processed.